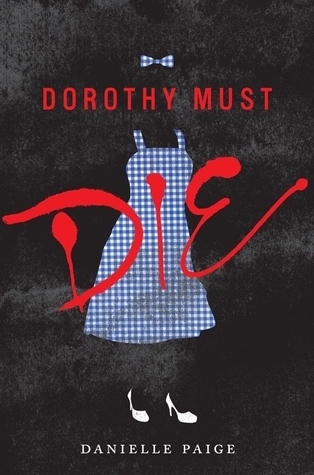 If you’re looking for a shocking, in your face retelling of The Wizard of Oz, look no further than Dorothy Must Die. There is a reason this book has been trolling through social media. Yes. It is that good! Alternative Amy Gumm is struggling to get through high school, but she’s used to that. With a druggie mother, Amy’s used to taking care of herself. That is, until the storm arrives. Amy is whisked away to the merry old land of Oz. Except, life here isn’t so merry anymore. The citizens are suffering, a war is brewing and magic is being sucked out of the land. Who could would do such a thing to this amazing place? Dorothy. And she must die. Forget all you once knew about Oz. Amy definitely isn’t in Kansas anymore, but she’s not in the Oz she remembers either. With stark wit and a blend of political violence that’s wrapped up in a magical red bow, Dorothy Must Die will change the way you recall the Emerald City. It will still make you reach for the book again and again, wondering what is going to happen next. This debut in the series sets the world, characters and goal beautifully. You’ll see the glittering bricks, smell the toxic poppies and will be blinded by what Dorothy has become. Which side will you take? 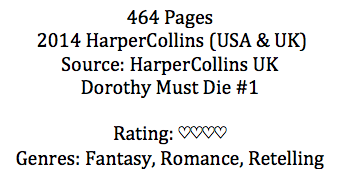 Are you with Dorothy or against her? For Amy, it’s clear where she belongs, and she’s not afraid of Dorothy. Many thanks to HarperCollins for providing me this book in exchange for a honest review.